‘Deadweight loss’ is just such an abstract notion for most folks that the costs is often ignored, it isn’t readily tangible – meanwhile, the perceived benefit to the masses of price controls is too compelling a result. Particularly at a political level, the supportive ‘cheaper stuff’ sound bite has a better ring than the opposing ‘deadweight loss’ sound bite. Excellent blogging—but as an American, I cannot look down my nose too much. Seems like yesterday the USA instituted wage and price controls…under President Nixon no less. And the eminent John Galbraith (I think it was) said wage and price controls worked during WWII so could work again. Poor Argentina. In the 1930s through 1950s, it was said living in Argentina was better than almost anywhere in the world, and Buenos Aires rivaled European capitals. They ate more beef than Americans. I hope they can get better. On a somewhat related note, what do you think of Chile’s Unidad de Fomento? 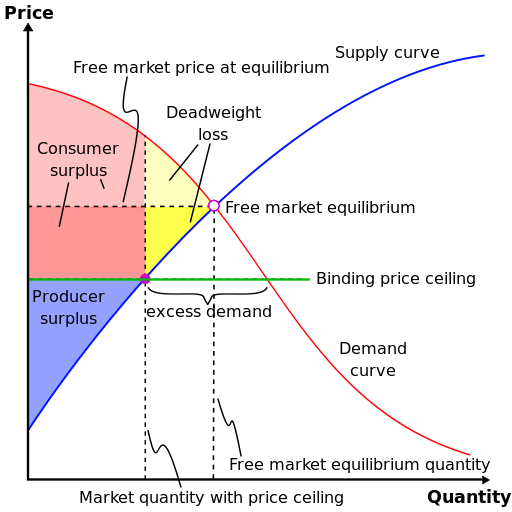 I’ve been wondering what Market Monetarists make of the idea of a dedicated unit of account, separate from money, designed to provide a constant measurement of purchasing power with which to denominate prices and wages. Would such a thing be compatible with an NGDP level targeting monetary regime? I asked Scott and he said that NGDP level targeting would make such a unit un-necessary, but then again he also thinks that inflation isn’t real, so I’d like your thoughts on the idea. I was just reading an article about activists balloon-lifting subversive materials into the North Korean regime. Perhaps someone needs to balloon-lift Mankiw’s principles text into Argentina!